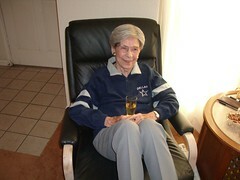 Mama Lucille enjoys a glass of champagne while watching a Dallas Cowboys game and wearing some of her Cowboys gear. My brother Jerry and Nancy Hobbs had an only son who was the shining star and the brightest hope of the Hobbs clan. Martin was outgoing, athletic, and full of energy. His grandmother Lucille and grandfather Wesley loved him dearly and spent many hours doing grandma/grandpa things with him and his little sister Shannon. In 1979, when Martin was fourteen years old, he came down with leukemia and had to spend weeks in the cancer care center in Dallas. Lucille was right there with him most every day wearing the bio-protective suit so they would let her in Martin’s hospital room. Some of the Dallas Cowboys were regular visitors. Roger Staubach, Charlie Waters, and Hollywood Henderson got to be Martin’s big buddies. And that’s when Lucille got to be such a big Cowboy fan. Hollywood was the most frequent visitor! This might have been before his problems with heroin. Martin’s cancer went into remission for two or three sunny years but the cancer came back and he did not survive the second episode. The loss of Martin deeply affected all those close to him. Hollywood Henderson got his head on straight, won the lottery twice, and built a big sports center for kids in Austin. Mama Lucille became a loyal Dallas Cowboy fan and tried very hard not to miss a single Cowboy game and she would watch other teams just to see how the Cowboys might be affected. She never bothered to watch any other sport except figure skating. Mama Lucille had a stroke Thursday evening, and died Friday morning August 8, 2008, almost certainly without ever regaining consciousness. She was ninety-nine years old and it was just the way she wanted to go. She wanted a closed-casket funeral, but some of us family peeked in and she looked great in her navy blue Dallas Cowboy tee shirt. Thanks everyone for your prayers and concern. God bless you and keep you. Last week in Houston, we took J. out to eat, and passed by the Houston Museum of Fine Arts. J. ran up and struck this pose spontaneously, with no prompting from me. The next second, a guard ran up and told us not to touch the statues. I don’t know, if they’re outside, they sort of invite a little participation, don’t you think? I bet the artist would have loved this. 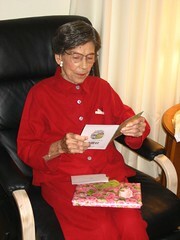 I lost a person who was very dear to me last week, and who I miss terribly. 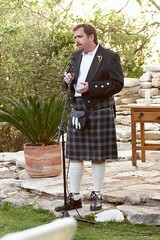 I had the honor of writing his obituary, which appeared in several Texas papers. While a truly complete tribute to him would always include the infamous and terrible “clown joke,” I’m not ready to write all that down just now, so I’ll post the obituary below. Matthew Scott Wood died on Thursday, November 1, after a struggle with lymphoma. Matthew was born in Tyler, Texas, grew up in College Station, graduated from A&M Consolidated High in 1987, and went on to attend Texas A&M University, where he was president of the Memorial Student Center and a winner of the Buck Weirus Spirit Award. After finishing his BA in Political Science there in 1992, he continued his education at the University of New Mexico where he earned double Masters degrees in international business administration and Latin American studies. He then embarked on a career that combined his love of economics and foreign language and lead him to become a leading journalist in the oil and gas industry and a mentor to many of his colleagues, especially his coworkers at Argus Media Group. Matthew loved traveling, learning languages, arts and music, and talking politics. He was an accomplished horseman, cook and storyteller; a dedicated member of his church; and a loving and devoted partner, father, son, brother and friend. 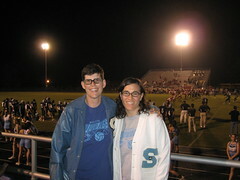 He is survived by his partner, Charles Kiel Reeves, and their daughter Jordan, of Houston; his parents, Sam and Janice Wood, sister Amy McNamara and nephews Tanner Seth and Tyndall Myers of College Station; his grandparents, Norine Scott Farber of Murchison and Helen Tyndall Wood of Sugarland; as well as numerous other family members and close friends. He was preceded in death by his grandfathers, Art Farber and Sam Wood, Sr. His loss will be felt by many, many people. Services will be held in Houston at Palmer Memorial Episcopal Church, 6221 Main Street, Houston, Texas 77030, where Matthew was a vestryman, on Tuesday, November 6th at eleven in the morning. Visitation with family and friends will follow the service. In lieu of flowers, Matthew has asked that donations be sent to Palmer Ministries at the address above, or to Casa de Esperanza de Los Niños at P.O. Box 66581, Houston, Texas, 77266.